Today I want to share something a little different. Do you have a home, an apartment, a bedroom? Do you feel like you are drowning in house work? Join the club! I am the mom of a busy 2 year old and a wife of a loving and understanding husband. He understands that I cant possibly keep up with the amount of housework it takes to clean our 3 level home. Although he gets it and helps out as much as he can, I still feel it is my responsibility and privilege to keep our beautiful house clean for my family. 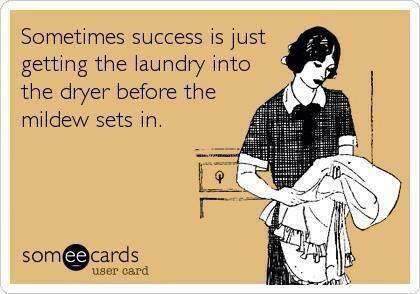 We have a busy life style and sometimes the cleaning falls behind....OK most times actually. 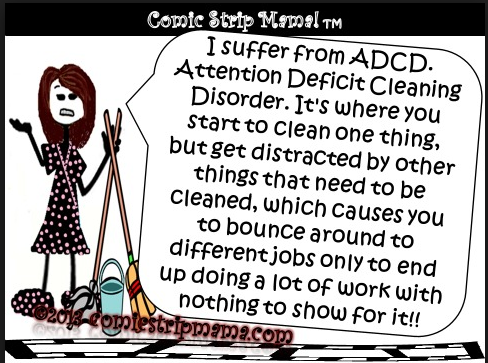 But when I look at the sheer volume of cleaning that needs to be done I instantly feel defeated before I even begin! Can you relate? So I came up with a system that works for our family and I wanted to share it with you! 7 Days to a Clean House. Please feel free to print this calendar I have created and use it for your own home if you like. 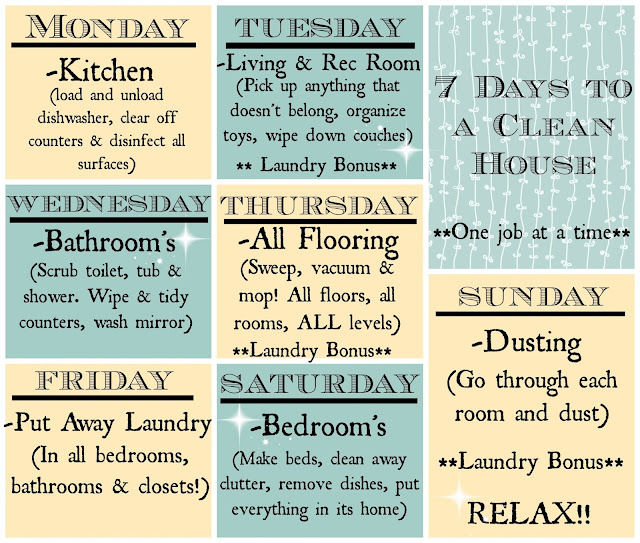 You will notice your work load becoming much less by realising one chore a day can KEEP your house clean. I know your thinking "But if I only clean the kitchen one day a week how will it look the rest of the week". Well I have an answer for you: It wont stay clean! And we all know that, but you will soon see that when you clean your kitchen on Monday and you put all your energy into that space then on Tuesday you will want to keep that space tidy. You will do your Tuesday chore and still do your dishes and wipe down the counters like you normally would everyday except all the "deep" cleaning is already done so you can focus on the next task. We used this system in our old house and it really worked for us (Time to bust it out again in the new house). Knowing I only had ONE job to do that day made it easier to keep the rooms I've previously cleaned tidy. Instead of doing a load of laundry EVERYDAY and forgetting it in the washer because you have 1 million other things to clean, save laundry for the specified 3 days a week. Making sure you complete a full load, wash and dry! With a busy 2 year old, a busy schedule and LIFE I simply do not have time to save all my cleaning for Saturday. I would rather clean a room for half an hour everyday and see results then have a house that stays clean for one day once a week. I hope this helps all you busy moms as much as it does for me! PS. Your doing a GREAT job!! Never tell yourself any different.